“Recent advances in science and technology such as online monitoring techniques, coupling of various processing methods, surface characterization and measurement techniques have greatly promoted the development of ultraprecise machining technology. This precision now falls into the micrometer and nanometer range – hence the name micro & nanomachining technology (MNT). 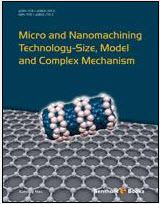 Micro and Nanomachining Technology – Size, Model and Complex Mechanism introduces readers to the basics of micro & nanomachining (MNT) technology and covers some of the above techniques including molecular dynamics and finite element simulations, as well as complexity property and multiscale MNT methods. ← BSP High Impact Factor Journal!